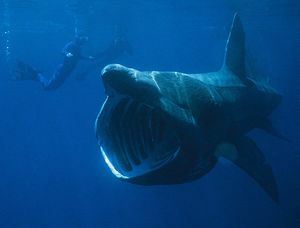 The basking shark is considered the second largest fish or shark, when compared to the whale shark. This gigantic creature is also known Cetorhinus Maximus by scientists and researchers who collect vital information from these animals. Thankfully, they do not prefer to eat humans instead they filter feed, just as the whale shark does. They are slow moving and an unusually large mouth. In which they filter feed. They are not dangerous to humans, because the giant shark is usually enjoying using its wide mouth to eat plankton. They have gills which filter out the items that they don't want, while allowing them to eat all the plankton that they want. These giant sharks can measure up to 33 feet long and the shark can weigh up to 4 tons. The most common names are the big-mouth shark, sun-fish, bone shark, and elephant shark.